My wife travelled to Hobart on Wednesday for work. She had a very busy two days but fortunately for me she had enough spare time during one of her lunch breaks to visit a book store on my behalf. Cracked And Spineless is one of my favourite secondhand book stores in Tassie and always has a few James Bond books on its shelves. On the day my wife visited there were several Ian Fleming novels on the shelves. So she sent me a photo and then a call. For some reason I didn't receive the photo immediately so she ran through them over the phone. I kept saying "Yep, got that" and "Got that"... 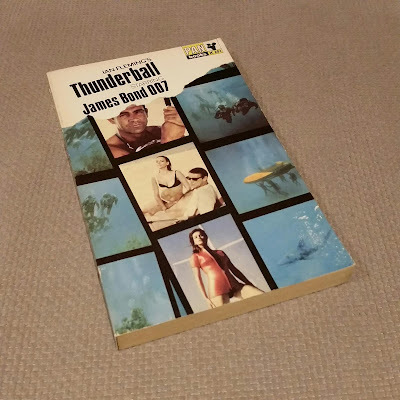 But when she mentioned the "Thunderball" movie tie-in and said it was in really good condition I knew it must be great. So she bought it for me and here it is. Pan Books, 14th printing, 1965 and looking as square and bright as the day it was published. The spine is perfect as the book has never been read. Definitely a gem of a copy, thanks to my fantastic wife.